You are here: Home / Our Animals / Chickens / What Do Chickens Eat? It’s incredibly important to give your hens a high-quality, varied diet. So, what do chickens eat? Feeding myth #1: It’s okay to let chickens forage 100% of the time. Feeding myth #3: Letting chickens eat eggs is cannibalism or will turn them into cannibals. But, there’s definitely things you should feed them and things you SHOULDN’T feed them. So today let’s talk all about what your chickens should and shouldn’t be eating. We’ll also debunk some myths about what chickens eat. So let’s get started! And in order to be able to do that you need to know what chickens eat. Plus providing your chickens with a high-quality, nutritious diet means that you will have great tasting eggs! My chickens aren’t super picky. Honestly they’ll eat ANYTHING. 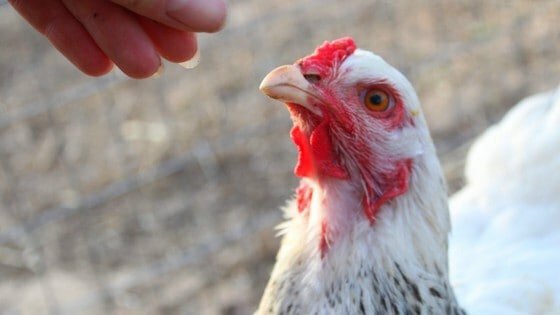 But I like to ensure that my chickens are getting the nutrients that they need, so here are some of the things that I think are the best things to feed your chickens. Layer feed is the cornerstone to any good diet plan for your hens. It contains all the nutrients they need to be healthy – laying eggs is taxing on a hen’s body, and the protein and nutrients it requires must be replenished. Once they start laying eggs, you should feed them a high quality feed with at least 16% protein daily. You can make your own feed using my recipe here or opt for a commercial feed. You might find that your hens will gobble a pelleted layer feed and refuse to eat a mash (or vice versa) – that’s okay. My Araucana chicken LOVES her mash – chickens are funny creatures and have their preferences just like we do. 3. They can also provide some environmental activities for your chickens in their run. 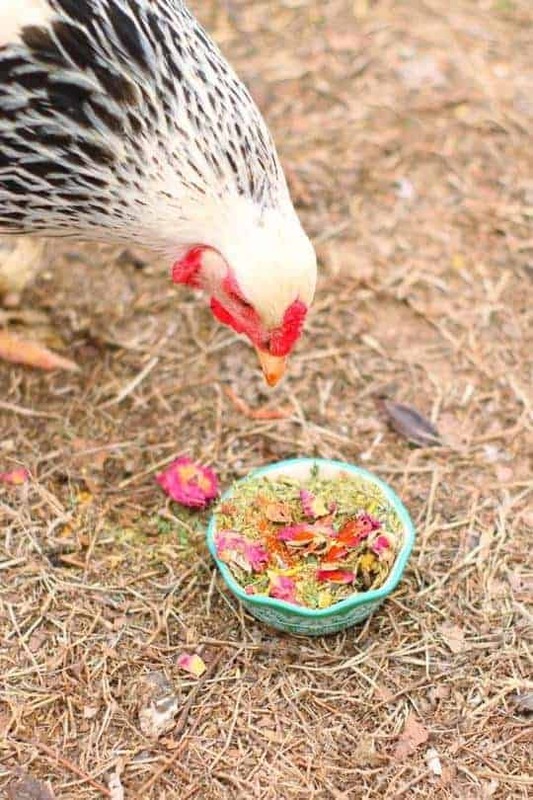 I just made a DIY Herb Pot for my chickens and they absolutely love it! Some of my favorite herbs that I use for my chickens are peppermint, oregano, and sage. 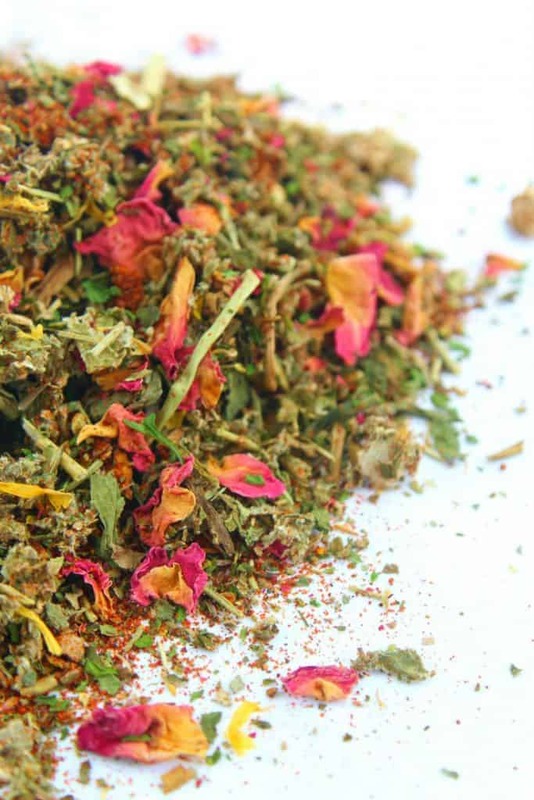 Oregano has antibacterial properties, so it promotes cleanliness in your coop. Studies have also shown that oregano helped chickens to be healthier and lay more! Garlic is great to add to feed – in studies, it’s been shown to boost immune systems in humans and animals alike. I also love using peppermint because it smells SO GOOD! And it also can help keep insects away from your chickens, and possibly help maintain a healthy respiratory system. Fruit can be great for your chickens because there’s lots of vitamins and minerals. Grapes, apple flesh (see below for more about apples), pears, raspberries, strawberries, etc are all great for chickens. Just keep in mind that some chickens won’t want fruit – mine don’t seem to be too partial to fruit (Hawk, my Araucana hen, really loves her black soldier fly larvae). Like anything else, fruit should be fed in moderation since too much of anything can be harmful for your chickens. I normally make sure that when I’m feeding my chickens “table scraps” (i.e. leftover fruits and veggies) it doesn’t exceed more than 10% of their diet. Chicken do like leafy greens – some go-to leafy greens are lettuce, kale, spinach, arugula, etc. Every year we grow our hens their own special greens garden by broadcasting seeds into a raised bed and then harvesting as needed. I don’t suggest letting the hens have access to the garden 24 hours a day – they’ll shred it to bits in no time flat. You can also grow greens and herbs in their coop, but give them limited access with a DIY grazing box, which is VERY easy to put together and durable – ours has lasted us several seasons. There are some leafy greens you should avoid feeding backyard cchickens, but we’ll talk about those later! By and large, your chickens can eat any vegetables you do – keep in mind that cooked, soft vegetables might go over better than raw. However, cooked veggies typically don’t have the same amount of nutrients as raw, so one option is to ferment your vegetables for 3-7 days so they get soft without losing nutrients. Fermented vegetables are also super healthy for hens because they have beneficial bacteria such as lactobacillus which can help balance their digestive system and possibly lower their pathogen load. In studies, hens fed fermented foods had lower incidences of salmonella in their systems. My chickens LOVE to eat sprouts. And sprouts are so easy! Sunflower sprouts are simple, although you can sprout wheat, oats, beans, etc. Chickens love them because they’re fresh greens plus seeds, and they love picking at both. They’re also extremely nutritious for chickens since a seed is full of all the vitamins and minerals required for the seed to generate new life. To learn how to sprout seeds, here’s a tutorial for sunflower seeds. Fodder is also something chickens eat – it’s basically sprouting seeds, but allowing them to grow into a grass or actual plant. Learn about growing fodder for chickens here. There are many myths about feeding your chickens egg shells, but egg shells are a great source of calcium and protein for your chickens and they are totally fine to eat them. Cooked eggs are best – as you know, raw eggs carry a chance of pathogens, and you don’t want your hens transmitting bacteria to each other accidentally or reinfecting themselves. You can scramble the eggs – just make sure they’re cool before giving them to your chickens. Eggshells are also great for chickens & an easy source of calcium. Again, dried, toasted eggshells are better than raw. One incredibly important aspect of your chickens diet is ensuring that they get enough protein. Chickens require a lot of protein to lay eggs and have healthy feathers, among other things. 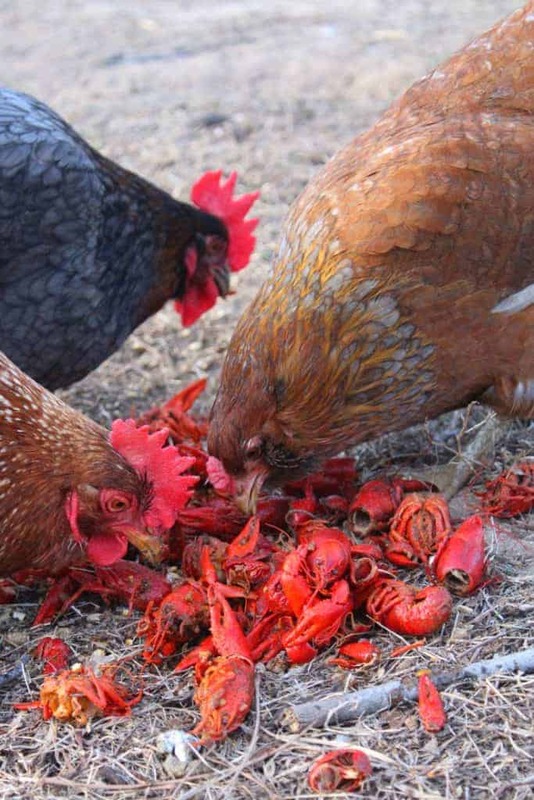 And one thing chickens LOVE to eat are dried insects such as Black Soldier Fly Larvae and mealworms. 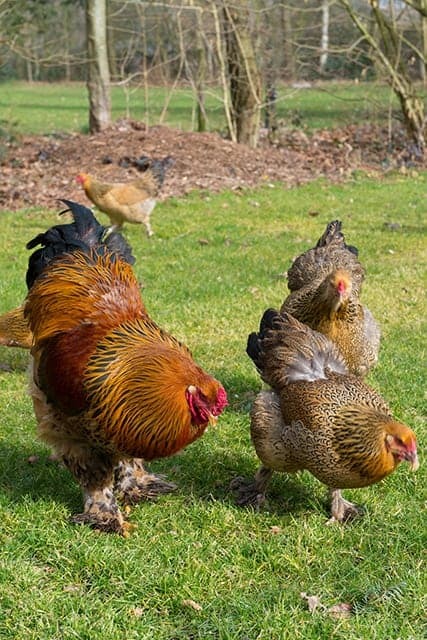 You can either mix in mealworms and black soldier fly larvae into your chickens feed to help them get the protein that they need or feed them separately – just be prepared to be jumped on when your hens see the bags! I have an entire article here about how you can raise your own Black Soldier Fly Larvae or Mealworms for your chickens. I mix in mealworms and black soldier fly larvae into my chickens feed to help them get the protein that they need. Yep, when asking yourself “what do chickens eat?” you might not think of meat. Remember, chicken are omnivores, so they will eat other animals given the need and opportunity. In fact, my Araucana hen will attack baby mice or frogs as sport. You might find that if your hens are protein deprived, they’ll start going after other animals to rebalance their nutrient deficiency. Excessive amounts of beet leaves, swiss chard, spinach (contain oxalic acid which can be poisonous in large amounts). So now let’s talk about some of the feeding myths that I hear ALL the time. Sure, if you want scrawny birds that don’t enjoy human interaction. Chickens can survive foraging on their own, but letting them forage can be detrimental to their egg production and temperament. I’ve let my chickens forage for 100% of their food in the past, but I noticed that my hens weren’t as healthy and they didn’t lay nearly as many eggs. You can let your chickens forage, but I recommend that you still supplement their diet with layer feed, so that your chickens stay healthy. You also run the risk of losing birds to predators when you let them forage 100% of the time, so I just don’t risk it anymore. It’s not, it’s actually healthy for them. See this article here to learn more about why citrus is actually good for your chickens. My chickens won’t even touch it when I give it to them, but it’s not poisonous and it has health benefits for your chickens. If you want your chickens to have the health benefits of citrus, you can always add a little to their water. This one is just not true. I don’t know who started this vicious rumor but it’s BS. Allowing your chickens to eat eggs is actually good for them and I do it all of the time. Just be sure to cook the eggs since pathogens such as campylobacter and salmonella have a chance of passing into the egg and you don’t want your chickens to reinfect themselves. Still wondering “What do chickens eat?” What are your chickens’ favorite things to eat? I’d love to hear about it in the comments below! My chickens love cooked potato skins, why shouldn’t you feed it to them ? Potato skins can contain poison if they’ve turned green. If they’re cooked, it’s definitely better than raw. I personally just stay away from feeding them completely.